I like being helpful (and I’m particularly helpful if you book me). So here’s what I do when I’m faced with some email copy that’s not working – and how in-house writers can make their emails more interesting, engaging and high-performing. You slept eight hours last night, but you’re still tired. It’s like you didn’t sleep at all. You tell the doctor about that niggling pain in your abdomen. He asks about food. You tell him you hate things you thought you loved, and love things you thought you hated. And, worse than that, sometimes you just throw up in the morning for no apparent reason. You know what’s causing your symptoms. You know what’s happened. The positive test you did last week probably gave it away. So what on earth are you doing here, and why are you pretending to be uncertain? 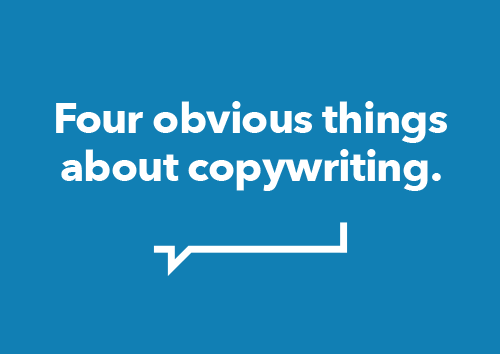 Do You Pay Your Copywriter To Write? Well, let’s hope you pay your copywriter. But what exactly are you paying for? It is the job of a freelance copywriter to write things, of course, and only natural to assume that the fee relates to the words. But why, then, do so few professional copywriters get into messy ‘per page’ or ‘per word’ discussions? Over at the Professional Copywriters’ Network, members continue to discuss how much different types of work should cost. What are people charging for website copywriting? What is the going rate for a single page sales letter? But if you’re looking for a copywriter and wondering how much you should pay, think less about the words and more about their purpose. A guest post by Alastaire Allday. As a freelance copywriter, I have fought against copy mills, bad clients, price-per-word estimates, and B2B jargon. But now I’m going to take a stand against something more controversial.